Another quick event of the day. 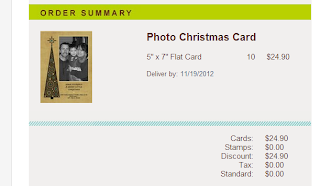 I ordered a 10 Free Holiday Card, whether it is a photo card or not at CardStore.com. They are so generous that most occasions they have to give out a free card for those who know when the free card ended. I haven't received the card yet, got an e-mail from the company about the volume of request they received so my order will be shipped a day late. For me, it is all okay, for this is a free stuff and I can wait until this free cards came to me. If you saw, I never pay for shipping nor put my credit card information. Now I am down to 10 Holiday Cards, I still have to make more for the rest. ive been meaning to order a personalized card too. wow free i like this one. is the freebie for members only or any customer new and old? I love free stuff and hopefully I can get some free personalized card too ! Oh, that is great! Now, you save the expenses for 10 cards this Christmas. Anyway, I am reminded that I have to have my Christmas cards done too. Wow, that free Christmas card is great! It is Christmas indeed. Would love to send a personalized Christmas Cards to my relatives too. Thanks for the idea. I want to have free Christmas picture too hehe, free is always great! I am also planning to do a Christmas calendar as a gift for my in-laws and for my parents in the Philippines..
Ive known some card maker here too that give free personalized card but as long as you order their personalized calendar. Congrats sis you got free cards..always the best! that's great :D how cool is that, you get to have a free photo christmas cards. I just got my free 8x10 print from walgreens too and a 50% off from the 71 prints i ordered. Love to receive free stuffs! I'll check on this maybe I can still get some free cards. yay, free is always a delight and you've got a nice card template there sis. I'll see if I can make way for this too. Really Appreciates your perspective towards my entries. Thanks for sharing and the time to leave your message to let me know you are here to support me too. Rest assure that I will be visiting you ASAP, and will do the same favor as you did for me.